Inspired by the sea, the bezel of the chronograph is made from a light blue ceramic. This serves not only as an eyecatcher, but is also a technical tour de force, as it is very difficult to create such a vibrant color without the pigments burning up. Hublot has shown in the recent past already that they master this delicate craft with for example the red ceramic version of the Orlinski Chronograph. The light blue of the bezel comes back on the dial, as the hour markers, but also the hands, are crafted in this color. The rest of the case is also made from ceramic yet in a deeper shade of blue. This provides a very beautiful contrast, especially since the case features both satin-finished as well as polished parts. The Garage Italia logo can be found prominently on the dial at three o’clock, while the navy blue rubber strap has a subtle texture in it. A titanium deployant buckle secures it comfortably around the wrist. Inside of the watch, we find Hublot caliber HUB1143. 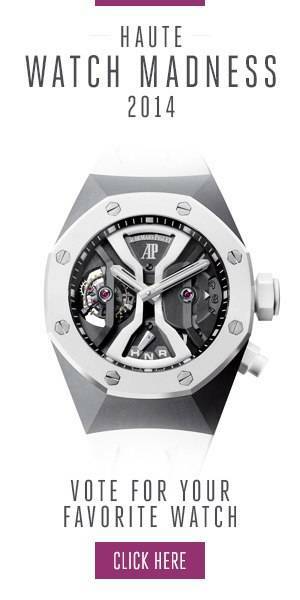 This automatic chronograph movement runs at 4 Hz/28,800 A/h and has a power reserve of 42 hours. Hublot will only be making 100 pieces of this limited edition. As the first in the trilogy created in collaboration with Garage Italia, this watch is expected to be followed in the near future by the ones dedicated to ‘Air’ and ‘Earth’.